Ahmed Fannun Kanan (at age 84) passed away in Joplin, Missouri on February 5, 2013. A devout Muslim, he was a leader, motivator, businessman, philanthropist and activist. 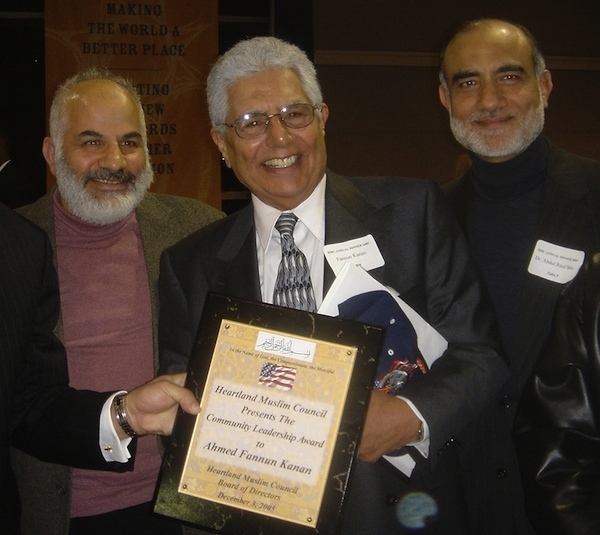 He was a model family man, friend, neighbor and a patriotic Arab Palestinian American..
Heartland Muslim Council presented the “Community Leadership Award to Ahmed Fannun Kanan in 2005. Even at few hours notice the Janaza was attended by about 200 people from across Missouri, Kansas, Oklahoma and beyond. “Uncle Fannun” as he was commonly known to hundreds or maybe thousands of youths and adults alike had touched many lives and communities in the USA and the Middle East. He had worked for many charitable causes around the globe. Many communities considered him part of them. Finally Joplin where he lived for the last 60 years had the honor to hold his final reception in this mortal world. May Allah receive him granting highest rank in Paradise. Fannun was a patriotic American and served in the 203rd Unit of the Missouri National Guard “to protect the United States, I love this country” he said. He was a successful businessman and a real estate developer. He loved children and supported several youth organizations and schools. Missouri Senate recognized and honored his services to the communities in the state. Fannun was a loving family man. His wife Elma V. Kanan converted to Islam and was his right hand person in the community work. They have a son Raaji and daughter Renee. Raaji Deen Kanan is a prominent attorney in Joplin, married to Rebecca and have 2 daughters. Renee J. Kanan MD, MPH; is the Chief Quality Officer for California Correctional Health Care Services. Fannun migrated to United States in 1951 from Bethlehem. When he landed in Kansas City, his first prayer was “Ya Allah help me build a mosque in this town”. His prayer was answered in 1981 when the Islamic Center of Greater Kansas City was built. He also provided major assistance in establishing the Mid America Muslim Cemetery and the Islamic School of Kansas City. He proudly announced “Kansas City is now the center of Islamic education.” In his 60 years in Missouri, he saw the community grow beyond his dreams. He supported mosques across Missouri, Kansas, Oklahoma, Arkansas and beyond. In 2005 the Heartland Muslim Council presented him the “Community Leadership Award”. He was appreciative and supportive of the work of the Islamic Society of North America (ISNA). He was profiled in the May/June 2003 edition of the Islamic Horizons magazine. Fannun performed Umrah and Hajj several times. He visited the Afghan refugees camps in Pakistan and the refugee camps in Palestine. He opened the doors of his house to accommodate some of the victims of the May 2011 catastrophic tornado in Joplin. President, Canaan Land Development Co.
Co-developer of ATT&T Call Center in Joplin. A facility for 600 employees. Fannun volunteered as adviser, consultant and benefactor to several mosques and Islamic Schools in the region. He was on the Advisory Board of the Missouri Southern State University. For many years he served on the Board of Directors of Ozark Center- a residential care ranch for children. I had known Fannun for the past 40 years. He was a man of principle, well disciplined, positive thinker and a motivator. In August 2012 when the Joplin mosque was completely destroyed due to suspected hate crime, Fannun consoled the community, saying “Allah will bless us with a bigger and better mosque. Joplin community has drawn out plans for the new mosque, but Fannun will not be around for the ground breaking and grand opening ceremonies. May Allah grant him bigger and better place in Paradise. Ameen!